Army Reserve Officer Training Corp (ROTC) is a program offered at hundreds of colleges and universities nationwide, training college students to be officers in the active Army, Army Reserve and Army National Guard. ROTC is a 4-year program, divided into two parts – a Basic Course and an Advanced Course. The Basic Course is normally taken in your freshman and sophomore years. The Advanced Course is usually taken during your final two years of college and includes a five-week Leadership Development and Assessment Course (LDAC) that is normally attended in the summer, between your junior and senior years. LDAC provides hands-on training and the confidence you can’t learn in a classroom. Yes, Army ROTC offers two-, three- and four-year scholarships, which pay full tuition and fees, include a separate allowance for books, and a monthly stipend of up to $5,000 a year. If you are interested in applying for an Army ROTC scholarship, please click here. What are the application deadlines for the Army ROTC scholarship? High school Senior: The application window closes 10 January. High school Junior: The application window opens 1 February. The ROTC scholarship selections are announced on December, March, and May. Do I need to join ROTC to enroll in Military Science classes? No, you do not need to join ROTC nor do you need to take any prerequisite classes to register for the Basic Course (the first two years of Military Science) classes. When I enroll in Army ROTC classes, am I joining the Army? Enrolling in Army ROTC is not, strictly speaking, joining the Army. You will not be sent to boot camp. However, the primary purpose of the Army ROTC program is to produce officers, so you must agree to serve as an Officer in the Army after graduation in order to go through the entire program, or if you have received an ROTC scholarship. Enrolling in the ROTC Basic Course (the first two years of college) does NOT obligate you to serve unless you have also received a scholarship. What are Army ROTC courses like? How will the class work help me? Will ROTC classes interfere with other studies? Army ROTC classes normally involve one elective class and one lab per semester. Although the classes involve hands-on fieldwork as well as classroom work, they are standard college classes that fit into a normal academic schedule. These courses can help students with personal and academic decision making while giving them the tools to exercise leadership in college life, even before graduating and becoming Officers. Is ROTC like “boot camp”? No. ROTC cadets attend college where they earn their degree. Attending Basic Training is not a requirement to attend Army ROTC. 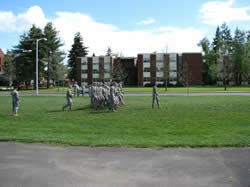 ROTC is an elective course and requires the same amount of time as any other college course, depending on the student. The Basic Course years (the first two years) incurs no military obligation, unless you are a scholarship winner. The Advanced Course years (the last two years of college) incurs a military obligation after you graduate with at least a Bachelors degree. Following graduation, ROTC cadets are required to serve in the Active Army, Army National Guard or the Army Reserve. All graduates are required to serve in the Army for a period of eight years, either on Active Duty, Army National Guard, Army Reserve or in the Individual Ready Reserve (IRR). The eight years obligated service can be served in one or a combination of Active Duty, Army National Guard, Army Reserve, or the IRR. In college and after graduation, cadets find that the training and experience they receive are assets – whether pursuing an Army or civilian career. Employers place high regard on the management and leadership skills cadets acquire in the ROTC program. ROTC experience looks great on a resume. When cadets complete the ROTC course and upon graduation, they become commissioned officers in the United States Army. For all other questions about Army ROTC, go to Army ROTC where you can browse through the FAQ and explore many other options available to Army ROTC Cadets.